It is always hard to say goodbye to the loved ones, but for career purpose, or some other reasons, staying together is not always possible. Goodbye Letter to Girlfriend is written by a boy to his girlfriend on his leaving. It is a way that makes your loved one special to you and you also express your emotion about the life without her. For maintaining the daily life, one has to go apart, but it does not mean that he permanently takes farewell. Through this letter a boy says his girlfriend that though they are separated physically, but not emotionally. If you have difficulty to write a Goodbye Letter to Girlfriend, as you feeling cannot come out in a right way. Use the format, provided below to make your own letter. As you know, I am moving to New York and shifting to Canada, this letter is to bid my goodbye to you. But it does not mean that I am leaving you. Whatever I decide it is for our bright future and make our life secured. After completing studies, I have to bag a job that gives us the financial independent. So when it comes to me, I need to go with it. I hope you support my decision. Though I am separated from you geographically, but in my mind you are always with me. Once the things settle down, we will soon make a plan to get together. I want to say I love you and I will be with you always, but now I want your support. Given Below are a few goodbye letter samples for a clearer Idea. To write a Goodbye Letter to Coworkers, one needs to express his emotional thoughts in a formal way. It is different from other styles of writing as it deals with your personal and professional experience both. Goodbye Letter to Employee is written while one is parting from a company. This letter carries an emotional element as it expresses the note of thanks to one’s coworkers for their support and encouragement. The Goodbye Letter to Boss, as the name depicts, is written by an employee to his/her boss on the account of his resignation. This letter generally conveys the note of thanks to his/her senior for being so helpful during the working days. 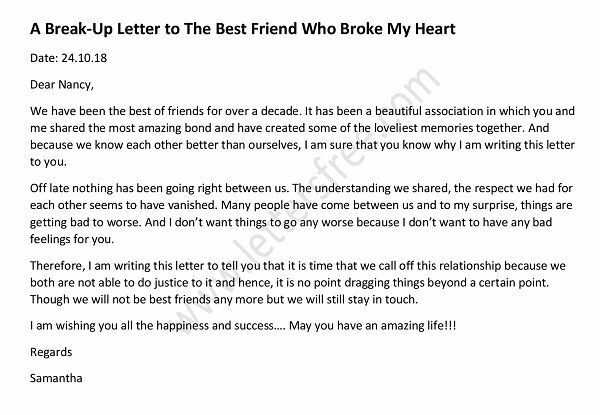 Writing a Goodbye Letter to a friend is not so difficult, but is different from other types of letter, as it expresses an emotional journey between two friends. Goodbye letter to boyfriend is such a personal letter addressed to a boyfriend to inform him that his girlfriend is leaving forever. It gives an opportunity to bid bye in a calm manner.